Help save SH Armstrong Pool This Sunday at 12 noon! Toronto neighbourhoods cannot afford to have recreation services closed by the city at the same time that our main streets, like Queen East, are undergoing significant intensification and many new families are moving into condos. 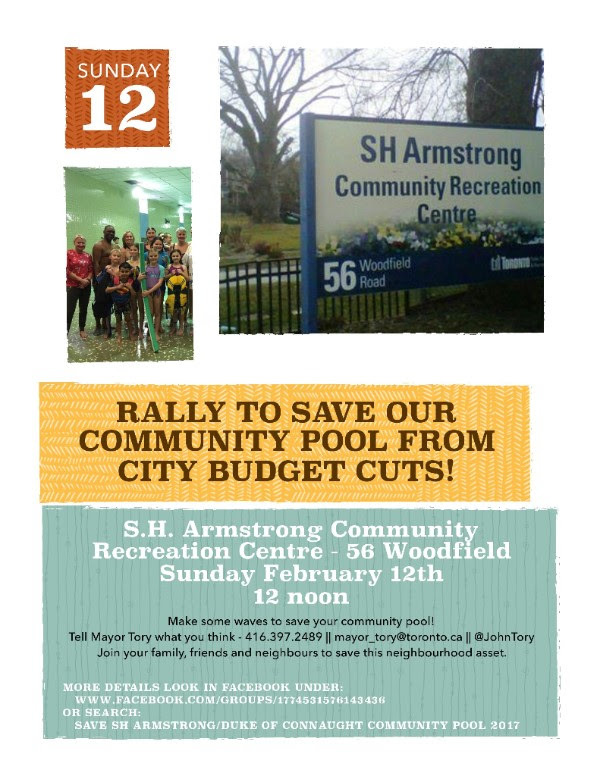 This Sunday at 12 noon, the Save the Pool Committee is calling a rally to gather support for the city to continue its programming at the SH Armstrong Community Centre at 60 Woodfield Road (at Queen). Please forward the attached poster or graphic to your lists and invite them to support this great community cause. If you can’t attend but want to make your views known, please email our Mayor at mayor_tory@toronto.ca free to copy me as well. For more details please look at the Save SH Armstrong/Duke of Connaught Pool facebook group page.